Snakes and Ladders Giant Garden Game - Bouncy Castle Hire 4 Kettering, Corby, Wellingborough, Rushden, Raunds, Rothwell, Desborough, Market Harborough, Adult Castle, Slide, sumo wrestling, Sumo, Crazy Games, Giant Garden Games, Northamptonshire. Our inflatables are ideal for kids parties, adult parties, Garden Party and a corporate or business event. Large and small events are catered for and we are fully insured. We offer cheap and discount prices in school holidays and for larger events. 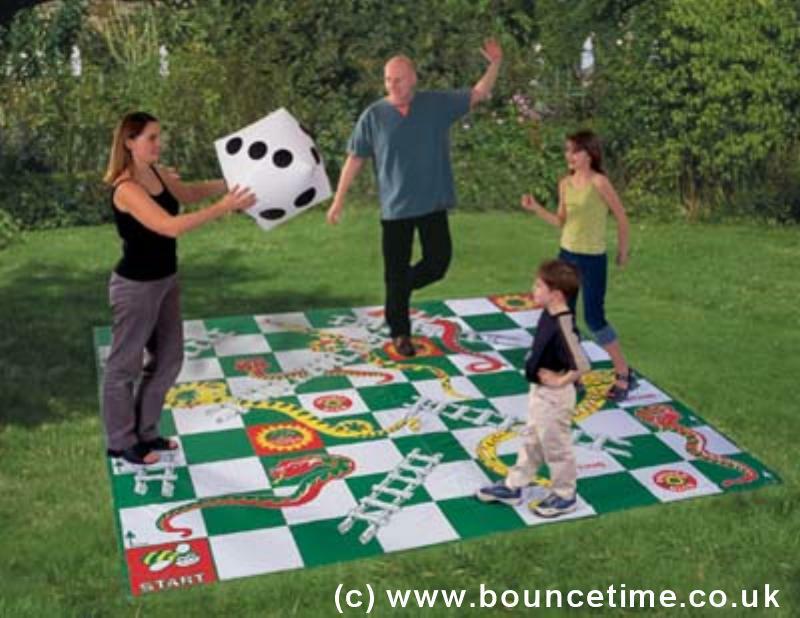 With this version of the classic traditional garden game, the players act as the counters, moving themselves around the giant board. The squares are big enough for an adult to stand on, We've also added some extra rules for extra fun. With a giant inflatable dice for the score, this is an all round family game.